Home EntertainmentHolidaysThanksgiving	A Week of Thanksgiving! 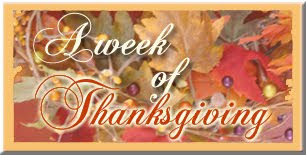 This week, I have decided to devote each day to a different aspect of Thankfulness. Every year, as we would sit down to Thanksgiving Dinner, my Dad would go around the table and ask each one of us what we were thankful for. Every year, I knew it was coming yet I would always freeze up when it was my turn. Surely there must be SOMETHING I am thankful for….and I would usually say, well I am thankful for my family and my friends and um…yeah. Next! I always felt like this was a cop-out answer and now that I am older and (hopefully) a little wiser, I would like to really take my time and acknowledge who and what I am thankful for this year. So, on this blog each day there will be a new post of Thanksgiving! Please comment with your own thankful thoughts. And if you feel so inspired to do your own blog post, feel free to grab the Week of Thanksgiving button for your blog and spread the word! Don’t forget to come back here and link us to your post! We’ll kick off the week with a fun giveaway so be sure to check in tomorrow! Happy Thanksgiving! Celebrate Thanksgiving with a Rwandan Basket Giveaway! great idea… I always have an easy time complaining but a much harder time actually thinking of legitimate things to be thankful for. I'm going to make an extra effort everyday this week.